The meeting was organized to discuss how to improve, among the countries represented, the operation of the Hague Convention of 25 October 1980 on the Civil Aspects of International Child Abduction (the 1980 Hague Child Abduction Convention) and the Montevideo Convention of 15 July 1989 on the International Return of Children (the 1989 Inter-American Convention) and to provide information on the implementation of the Hague Convention of 19 October 1996 on Jurisdiction, Applicable Law, Recognition, Enforcement and Co-operation in Respect of Parental Responsibility and Measures for the Protection of Children (the Hague 1996 Convention); and as a follow-up to the judicial seminar on the operation of the 1980 Hague Child Abduction Convention in the Inter-American region held in Monterrey, Mexico, in December 2004 and the Inter-American experts meeting held in Buenos Aires, Argentina, in 2007, in order to chart regional developments since those meetings, and to set new goals for the region for the coming years. Preparation for and involvement of the Latin American region in the up-coming Sixth Meeting of the Special Commission to review the operation of the Hague 1980 Hague Child Abduction Convention and Hague 1996 Convention which will take place in June, 2011. 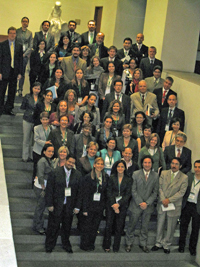 Participating States and organizations: Argentina, Bahamas, Brazil, Chile, Colombia, Costa Rica, Dominican Republic, Ecuador, El Salvador, Guatemala, Honduras, Mexico, Nicaragua, Panama, Paraguay, Peru, Trinidad and Tobago, Spain, United Sates of America, Uruguay, Venezuela, the Organization of American States (OAS), IberRed, the Inter-American Children's Institute (IIN), the Ministry of Foreign Affairs of Mexico, and the Hague Conference on Private International Law. The Conclusions and Recommendations of this meeting are available in the following languages: English | French | Spanish.